Inspired by the flavors of classic cocktails, these handcrafted jellies bring sweet mixology to your table. Inspired by the flavors of classic cocktails, these handcrafted jellies bring sweet mixology to your table. The set of four varieties includes Strawberry Daiquiri, Margarita, Peach Bellini, and Piña Colada jellies. A unique addition to your breakfast spread, they also make enticing snacks when served with cream cheese. Try them as a topping for ice cream, pancakes, or waffles. 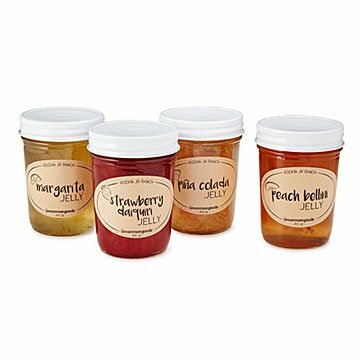 Featuring all-natural ingredients and preservative-free, these jellies are handmade by Janice Davis and Ray Zies in Buffalo, Texas. Janice Davis, a native of New Orleans, and Ray, a native of Texas, are both certified public accountants with 30 plus years of accounting and finance experience in various locations through-out the United States. However, their passion has always been cooking. Janice had grown up in the kitchen helping her mother with home cooking and with her catering business. Ray also grew up helping his mother in the kitchen and learning how to make jellies, jams and preserves. After retiring, they built a commercial kitchen halfway between their houses on their 100 acre ranch. Together, they combine the Creole cooking of New Orleans with the down home cooking of Texas. I had ordered these for hostess gifts and one was opened, it was also quite sticky on the outside. I can't give the opened one as a gift since the pop seal was broken. The others are quite runny as well...almost more of a syrup texture than jelly. So far I've only tried the Strawberry and the Pina Colada - but they are fantastic! I'm going to be buying another set as a birthday gift for my best friend. Would have been a good gift if they packaged it right. Cannot give people a opened food gift. Did not return e-mail or re-inbursed me. Like the packaging and descriptions. Haven't tried yet as these are for Christmas gifts. Looks good! Love, love these cocktail jellies. The flavors are fantastic and add zing to any bread product. I love all the flavors, but the peach bellini is my favorite. This is my second order of these jellies. I bought this to give as a gift for a friends birthday. I have not given it to her yet, but I'm sure she'll like it...the flavors look yummy. If she likes the taste, I'll be sure to order it for others, as it makes for a different kind of gift. I like Uncommon Goods because their merchandise is unique. I plan to include packages of Lorna Doones with the jellies .....should be delicious! This was a gift and the recipient is enjoying it. Nice idea for people who are not looking for more "stuff"
I'm a bartender so I was thrilled to see cocktail-flavored jams at Uncommon Goods. Mother's Day was the perfect opportunity to surprise my Mom with some of the flavors I'm making every day at work, and she loved them.